Time flies when you’re having fun, and at the Raja Muda the programme speeds up as soon as the fleet reaches Penang. After two passage races in the first three days, all of a sudden it’s rickshaw racing, inshore racing, hand out the biscuits and depart. It feels rather like ‘blink and you’ll miss it’ but actually it’s a little longer than that. The fleet arrived at Straits Quay Marina on Monday evening and Tuesday morning to find that the Penang government is hell-bent on changing the geography hereabouts. Massive land reclamation projects promise to change the map of Penang, literally, with the side effect of generating a lot of sand and silt that finds its way into the marina basin. That’s a problem, and most of the fleet remained at anchor outside the marina – and that’s another problem, as that calls for a water taxi service capable of shuffling 300-odd sailors back and forth. After a day’s recuperation for all but the very latest arrivals, Tuesday evening was the annual Penang Rickshaw Racing. Side-by-side and wheel-to-wheel as sailors try to outdo each other in the running, manoeuvring and drinking stakes. After a few brisk rounds of the Straits Quay waterfront, crew from Starlight and Alive lined up for the final, with skipper Duncan Hine (Alive) wishing that there were longer pauses between ‘rounds.’ Starlight reigned triumphant, the rum and the whisky and the elegant and tasteful winner’s tankard were all handed over, and everyone went back into Healey Mac’s for another well-earned drink. 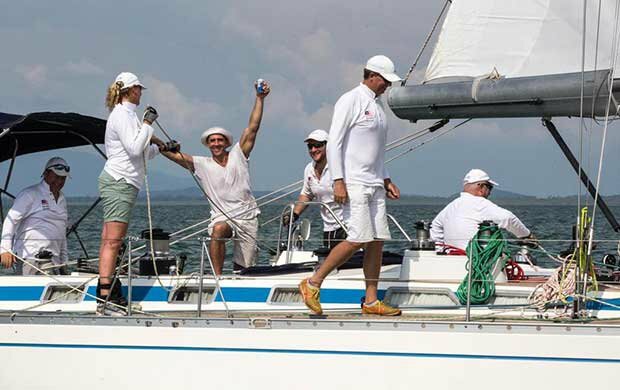 Wednesday (yesterday) was Penang Inshore race day. Two windward/leeward races for the IRC classes and one circuit of a cruising course for the remainder. This year the event was named ‘Faye Khoo Penang Harbour Series’ in cheerful memory of the irrepressible late Ms Khoo; foodie, journalist, shipmate, drinking buddy, enthusiast, energiser and tireless champion of all things Raja Muda. After Faye, they broke the mould – which is probably a good thing as by now we would all be exhausted trying to keep up. With fond memories, RIP. Penang always promises nothing, but produces something in the end – it’s just a question of when. There was a flat calm and heavy heat to start the day, but quite remarkably the breeze came good by the scheduled start time of 1300h with a healthy 8-10kts that grey during the rest of the afternoon to a sustained 3-15 gusting 17 in the puffs. Sarab Jeet Singh’s Windsikher crew took ‘destruction testing’ to a new level when the blew up a spinnaker on its very first airing (what is the warranty on a spainnaker? ), Alive tore up the flat water racetrack with style but not quite enough speed to leave the rest of the fleet behind on handicap, and Fast Track continued her own special sail testing programme by trashing two more headsails. Maybe the baggage truck carrying all the spares and cruising gear Langkawi should have stayed with the fleet, stopping at every port to support Fast Track? David Fuller’s Fujin, with smiling Jamie Wilmot at the wheel, maintained a clean sheet of first places – four, from four starts so far. 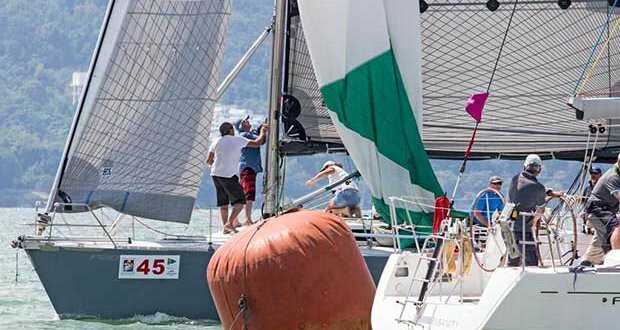 Marikh, a Contessa 32 sailed by the Royal Malaysian Navy and the smallest boat in the fleet, punched above her weight to win the Class 6 race from La Samudra, and whole new set of names appeared on the Class 5 podium at the end of the day. It was a quick turnaround on shore before heading off to the Khoo clan house, the Khoo Kongsi, in the middle of historic Georgetown. If there is a prizegiving party venue anywhere that is more spectacular and more evocative than this one, please let us know; tasty Penang ‘street food’, Oriental splendour, buckets of history, lion dancing and brick-smashing cultural entertainment, and of course lots of prizes. It’s an event all on it’s own, and very much a high spot of the traveling show that is the Raja Muda Selangor International Regatta. Today: Penang to Langkawi, 56nm. Forecast: good.